My very first experience in a museum was, as far as I can remember, intimidating. I over-distanced myself from Auguste Rodin’s exquisite bronze sculptures for fear that I would fail to resist the impulse to touch them and get myself into trouble. I felt a similar impulse when I ran into Sharon Core’s series of works in a second floor gallery at the Phillips today. Although the experience wasn’t intimidating this time, the temptation to touch the work was as hard to resist. This time, it wasn’t a sculpture; yet as solid and life-like. The photographs’ three-dimensional quality and tangibility tricked my eyes into thinking that what I saw was a real object. I had to stare at the works for a while to decide whether these were photos or paintings; their subject, composition, and painterly quality instantly reminded me of still life paintings from the 19th century. 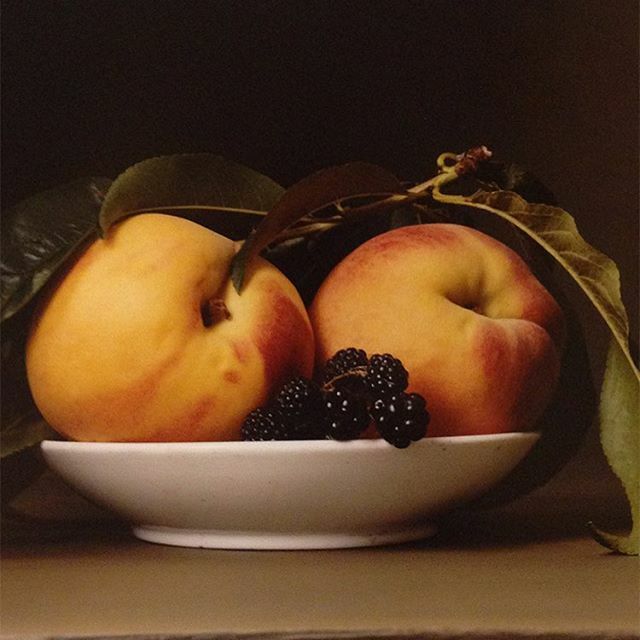 As speculated, Core was inspired by the compositions of 19th century American still life painter Raphaelle Peale. By meticulously rendering details and emphasizing texture, Core overcomes the limitations of photography and captures features that would have been hard to see even in real life. In fact, the highly contrasting lights, vibrant coloration, and the lustrous texture of the objects are all pictorial elements that could have only been achieved through the labor-intensive process of assembling the materials and arranging the setting. Across the room hangs a row of still life paintings by post-Impressionist artists. One of them is Paul Cézanne’s Glass and Apples, which is rather muted in tone with no striking tactile appeal. With the emergence and development of photography in his time, Cézanne would have found no point in creating a photo-realistic representation; rather, he was more concerned with capturing the very essence of painting and conveying his own perception of the subject. Ironically enough, Core’s vibrantly colored, highly-staged photographs that imitate the style of still life painters predating Cézanne, hang right across from his rather simple composition. As FotoWeek is approaching, come visit the Phillips and take a look into Core’s work that jumps across the boundary between painting and photography. What about Core’s prints is similar to Cézanne’s painting? What’s different? This entry was posted in Experiment Station and tagged painting, photography, photorealism, photorealistic, sharon core, still life, still lifes, still lives, trick of the eye, tromp loeil. Bookmark the permalink.